Apple's support for new third party App Extensions to extend the features of iOS 10's Siri voice assistant involves an Intents and an Intents UI framework, the former of which outlines how users can interact with apps via Siri, and the latter enabling third party apps to customize the interface users see when making requests through Siri. As previously described, third party apps can register App Extensions that extend Siri into new Domains of functionality, including ride sharing or payment services. The design of the UI Intents framework does more than just facilitate a customized UI for Siri: it's also used by Apple's iOS 10 Maps to enable users to similarly set up a ride sharing service from within Maps, presenting a consistent interface no matter how users approach setting up a ride. During the WWDC Keynote, Apple's head of Internet services Eddy Cue demonstrated a variety of new iOS 10 Maps features, including an enhanced search interface that slides up from the bottom of the screen and leverages proactive intelligence to suggest common routes or the locations of upcoming calendar events. He also presented new search filters (for use in limiting restaurant results to a specific type of food, for example), as well as a new dynamic view with driving directions that changes the angle and zoom level as you make turns or enter a straightway, with manual pan and zoom features for looking at the approaching traffic conditions. Maps will also gain support for searching for points of interest along your current route (above), as well as suggesting alternative routes based on traffic. 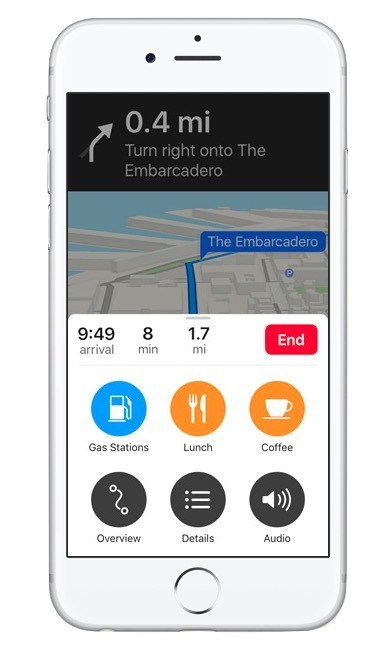 Additionally, new CarPlay support allows car makers to integrate Maps' turn-by-turn directions into the instrument panel, and Maps can automatically help you remember where you parked your car. One of the biggest new features Cue demonstrated for Maps, however, was support for third party apps: finding a restaurant via the existing Yelp integration, setting up a reservation through Apple's new partnership with OpenTable, booking a ride there via an integrated Uber booking mechanism, and paying for it using Apple Pay. Apple's Maps have long integrated with Yelp points of interest. 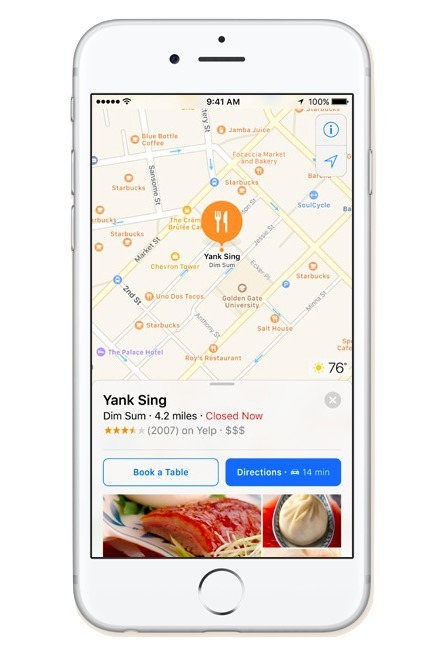 OpenTable's integrated reservation functionality, now directly available within iOS 10 Maps, appears to be a similarly "closed" partnership Apple has introduced (portrayed below), although Cue outlined that this functionality would be open to "all developers around the world," specifically citing two other table reservation apps, one of which serves China. The riding sharing functionality Apple demonstrated with Uber, however, is already an openly documented App Extension available to any third party ride sharing service. Support for Apple Pay within Maps is also new, and available to any developer building a ride booking App Extension designed to work within Maps or with Siri. In the future, Apple is more than just "likely" to expand App Extension support within Maps to deliver new domains of functionality--perhaps third party services providing alternative transport (bike directions) or routing (like Waze), or indoor maps for venues, alternative ticketing or reservation systems, and so on. Apple frequently builds services internally that it later opens up to third parties. Examples include Share Sheets, which Apple introduced with internally-created support for Twitter in iOS 5, before unveiling a Sharing App Extension anyone could use to build in support for their own social network in iOS 8. The new Maps App Extension support introduced for iOS 10 shows that development among teams in iOS is tightly integrated, meaning that third party developers working to add support for one new feature (Siri) can reuse that same effort to take advantage of new features in Maps, and elsewhere. Apple's ability to get third developers to support its latest efforts is closely connected to the company's capacity to quickly deploy new versions of iOS across its user base. New users quickly adopt the latest version of iOS, stoking demand for apps that take special advantage of new features. Last year, Apple's support for features such as in-app Apple Pay, deep linking support for Intelligent Search and iPad Slide Over and Split View were rapidly adopted by App Store titles. Google's Android introduced a variety of features last year too, but a year later only a tenth of the installed base can make use of some of these, making it pointless for most developers to focus on supporting features that few of their users can even benefit from.